The Railway Recruitment Board is conducting the Assistant Loco Pilot and Technician Examination from January 21, 2019 to January 23, 2019. RRB ALP Stage 2 Exam is conducting their last day of the examination today. So, we are providing you the detailed exam analysis of day 2 exam- slot 1. Candidates who are attending the further slots can go through these questions before going to examination. Most of the questions would be repeated from previous examination. So, candidates are suggested to go through the analysis once. The slot 2 paper of the day was hard and candidates found it tough to answer. 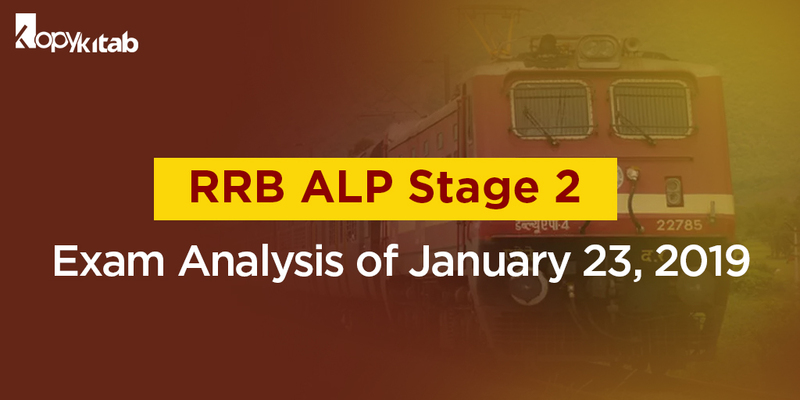 Candidates who take up examinations next time are suggested to go through all the 3 days RRB ALP Stage 2 exam analysis during your preparation. The Slot 3 paper was moderate difficulty level. Few questions were similar to previous papers while most questions were new. We have compiled the questions from each section for you. Go through the analysis here. Sanchi stupa was construced by whom? Red Data list is published By which Organization? Recently appointed Cheif Justics Of India? Pongal is celebrated in which State? Find slope of the given equation? Compared to all other slots, the slot 2 paper was too hard. According to the reviews given by the students, the paper was tough and most of the questions were out of syllabus. Here is the analysis of slot 2 exam. Who is the captain of Chennai Super Kings team 2018 in IPL? Which country is not a permanent number in UN Security Council? The overall difficulty level of slot 1 examination was moderate. Mathematics and General Awareness was easy whereas the other two subjects General Intelligence and General Science were moderate. 4-5 questions from heat and temperature. 1 question from seating arrangement. 2 questions each from analogy, series, blood relation. Which pin is used in crankshaft and connecting rod? Which type of battery used in automobile engine. Range of volts in automobile battery? Candidates attending upcoming exams can refer to these questions and prepare themselves. Stay tuned for further slot analysis.